Here’s an excellent deal. 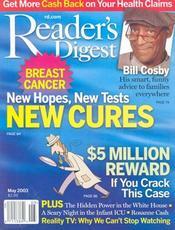 Right now, Discount Mags is offering a one year subscription to Reader’s Digest for only $2.99. Use coupon code: 3051 at checkout. You can get up to a 4 year subscription for only $2.99 per year. I just purchased a four year subscription. My total was $11.96.